In some of the world’s driest places, atmospheric moisture is a major source of water for native ecosystems. Some algae, plants and insects in the Israeli and Namibian deserts get much of their water from fog, dew and humidity. The spines of some cacti species have evolved to collect fog droplets. California’s redwood forests derive a significant amount of their moisture from fog. Some drought-minded California residents along the coast, perhaps yearning for a clear ocean view, have suggested harvesting fog as a water supply. Globally, few places get drinking water from coastal fog. They are mostly rural areas with abundant fog but little other available water. 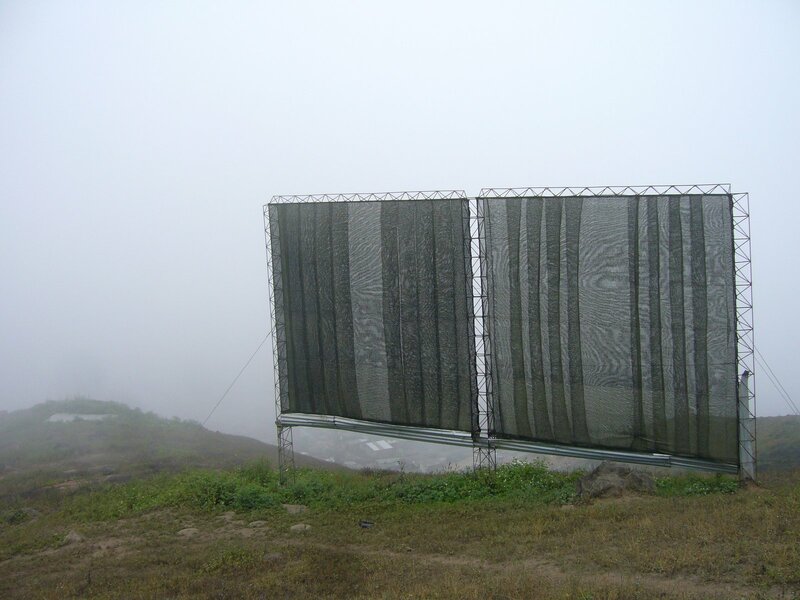 Communities along the parched northern coast of Chile have captured fog for some of its water supply by erecting large fences of synthetic fiber cross-wise to the coastal wind. The condensate on the netting is channelled for collection and use. Fog harvesting yields from 1 quart to 3 gallons of water daily per square yard of fog mesh . What would this mean for a typical coastal household? A household of three that uses 300 gallons a day would need 1,030 to 12,300 square feet of fog mesh . To fit on a typical single-family lot, the length of the fog fence would be limited to about 50 feet. That means the fence would need to stand 21 to 250 feet tall, about the height of the State Capitol dome. To fit on a typical single-family lot, the length of the fog fence would be limited to about 50 feet. That means the fence would need to stand 21 to 250 feet tall, about the height of the State Capitol dome. Illustration by Stephanie Pi, UC Davis. Building such a fence would cost a household thousands of dollars and require cleaning (algae tends to grow on the mesh) and repair (the mesh becomes a big sail in a storm). Homeowners probably also would want a sizable water tank to fill for periods of clear weather. For virtually all homeowners, a fog water supply would almost always be costly and inconvenient. Some households might use fog as a supplemental supply, but it usually will be at a steep additional cost. If these numbers were scaled up for San Francisco, population 800,000, the fog fence would need to cover 10 to 120 square miles, or 20 percent to 2.5 times the area of the city (47 square miles). Fog will unlikely be a major water supply for California. But this is only for atmospheric fog. 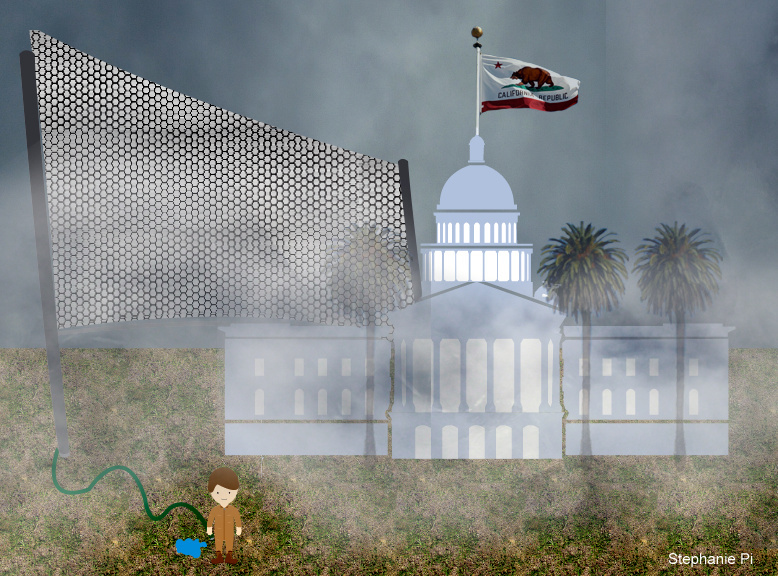 More petty forms of fog frequently blur discussions of water in California. If we could demistify some of this haze, we might condense our discussions and diminish our droughts. Oddly enough, apparently a SF Bay Area vodka maker is experimenting using fog-collected water in its distilling: $125 per bottle. At that price, I expect it is economical. The density of liquid water is 1,000 kg per cubic meter. The density of water in fog might range from 0.05 to 0.5 grams per cubic meter. If the fog mesh can wring 10 to 50 percent of the water from a coastal breeze blowing 2 miles per hour for half the day, then 1 cubic meter of fog mesh would produce roughly 1 cup to 2.5 gallons of water a day. Not a bad agreement between theory and practice. To meet a daily water demand of 300 gallons, the coastal household would need a giant square fog mesh of 32 to 111 feet on each side for a total area of 1,030 to 12,300 square feet, which is larger than most California houses. Goodman, J. 1985. “The collection of fog drip”. Water Resources Research, Vol. 21, No. 3, pp. 392-394. A very small field experiment on coastal Montara Mountain south of San Francisco, Calif. This entry was posted in Uncategorized and tagged drought, fog, Jay Lund, water supply. Bookmark the permalink. Very cool! Thanks. Let me know when is the results are ever plotted or written up. Thank you for the analysis Professor Lund. Most advocates of water harvesting fail to recognize that high baseline demand/expectation makes such methods nearly useless in places like California. Even in the worst water-stressed years, the volume of water available in California is nowhere near as bad as even the best years in micro-regions such as the one in Chile you describe. A technology that is good only for minimum sustenance only has a marginal role in water policy of infrastructure-rich California. Thank you for this great article! I find the comparison of required net height to that of the state dome quite compelling. I have one question: why is there such a large range of required net size and corresponding land use (e.g., 1030 to 12300 sq ft of mesh, 21 to 250 ft in height, 10 to 120 sq miles…)? My best guess is that this is due to regional/temporal variability in fog harvesting yields (1 quart to 3 gallons), which is also quite large (up to a factor of 12). Do you have any tailored estimates for implementation in SF? Given the costs associated with putting up a fog net, IF fog harvesting were to be implemented on a household level in the SF Bay Area, it wouldn’t make sense for users to buy a range of net sizes to accommodate fluctuating fog density. It would be better to find an optimal size that maximizes yields while minimizing costs and land-use. Do you have any idea what this optimal size would be? I believe that calculating this will help demystify the potential of fog harvesting, by more accurately visualizing the impracticability. I tried to pick a wide range of what seemed to be likely moderately extreme values, and then work them through the math. Since many of these factors are multiplied (e.g., water for density times efficiency of extraction), the resulting range can become quite large. This is a wonderful article. But I wonder if it’s possible to take a much more optimistic view of harvesting mist? First, a household of 3 humans can live very well on much less than 300 gallons/day. People don’t need so much, it’s the lawns and gardens that demand the extra water. But those are optional in a deep drought. Second, the point of harvesting mist is not to replace the entire water supply, but to boost it enough so that the rainfall-based supply remains adequate for economically critical uses. Third, a large number of California homes already have 6-8 foot high perimeter fencing, which could be replaced with “fog fencing”. As existing fencing ages out, if it were simply replaced with water-harvesting fences, that could provide a significant source of water. And the maintenance costs of fencing are treated as a cost of living, not an unusual expense. So even if it’s only a 10% to 30% replacement for rainfall, fog fences could be very valuable. And any technology that diversifies the water supply has added value simply by improving the overall stability of the system. That’s the same idea behind diversifying investments in a 401K. Finally, in a “necessity is the mother of invention” fashion, perhaps the efficiency of mist harvesters might be increased with a bit of Silicon Valley ingenuity? Your 10% to 30% replacement figure is way too optimistic. Even in the foggier areas of the state, the fog water yield is likely to be much less than 5% of a person’s average annual use. But, I agree that we should diversify our water resource portfolios. And if you live in a very foggy area, have the room and can afford the infrastructure, I say go for it. is it possible to make fences that are solar panels also? then it maks this a lot more interesting and if placed on buildings would collect even more water also. Thank you Dr. Lund for this article. We’ve had many people in Santa Cruz County suggest fog catchers. We’ve explained to them the limited benefits that you have mentioned here. Even though the per capita water use in Santa Cruz County is much less than the State average, appropriately sized fog-catchers on individual properties would still yield less water than one person uses in a day. Combining that with the limited number of intense fog days, partial foggy days, the expense of equipment, construction and maintenance, the practice yields very limited benefits. I think the readers should bear in mind that where fog-catching is practiced in the world, it is done so on a subsistence level and because they have few other water supply options. Really interesting article! Reading the title, I first thought this would be about natural infrastructure (i.e. trees, soil) that catches fog and contributes to increased groundwater and runoff. I was unfamiliar with the idea of fog fences. While it sounds like they are unlikely to be a disruptive water technology, it still seems like the extra runoff we get from fog is significant! (but not something we have a lot of power to affect – unless forestry management impacts the amount of fog that ends up in streams and groundwater). At this point, the fog catching system only needs to supplement the amount of water we’re being asked to conserve. Can the fog catching net be spanned across the profile of the Golden Gate bridge to catch the fog? Good PR even if the water is of limited quantity. In an area of Patagonia mist fences were strung all along mountain crests over 100 years ago. Water was fed down the mountain in channels for some distance and a veritable community sprang up and thrived for decades. But the fences decayed and wore out and the water supply dried up, and the community moved out….basically they had lost track of the “Technology” that had sustained them for so long. I can testify that large tracts of the Sahara desert would benefit massively from such traps, the tops of the dunes in the early morning hold sand that is so wet(6 inches below the surface) that you can literally squeeze water out of them. With the climate shift will come a much heavier load of water borne in the atmosphere and this method of collecting it will be more interesting….as will a lot of other technologies that are currently ignored. I totally agree with the commentor that pointed out the use of 300gal of water use in a single family ….that is astonomically extravagant, no wonder California has a water problem. Fog catching is a good solution for poor countrys, but mabe not for CA. What are the costs for a fog collection project? Costs are variable depending on location, access and whether all labor costs are donated. The small fog collectors for the evaluation cost $75 to $200 US each to build. The large 40 m2 fog collectors cost about $1000 to $1500 US each and can last 10 years. A village project producing about 2000 L a day will cost about $15,000 US. How much water does a fog collector produce? One large fog collector, with a 40 m2 collecting surface, will typically produce an average of 200 L per day throughout the year. On some days no water is produced. On other days as much as 1000 L will be generated. The variability depends on the site. Choosing an appropriate site is of utmost importance. There are both day to day variations in fog-water production as well as seasonal variations, as is the case with rainfall. How is the site selected? What factors need to be considered? I would assume humidity, wind, topology, temperatures, terrain, UV, due point temperatures etc. Thanks for sharing the info. I would like to try this sometime to collect enough water for birds in the wild this summer. Dr. Lund’s background is large public infrastructure and large scale economic analysis so I feel the article speaks to the old school centralized infrastructure thinking that the Romanesque thought processes firmed up a couple millennia ago. Tis’ true that we still find ourselves in this mold unable to think massively distributed nor have the financial models or methods to even test massively distributed push-pull water models. This leads to dramatic metaphors like the state capital fog fence. What would be more interesting is an analysis of the fog water capture of every 6 foot tall redwood fence in Northern, CA, given that surface areas as well as not cutting all those redwoods – what total potential assuming fresh water could be pushed back into the pipes could be collected using that surface area?